Filosofisk supplement har intervjuet Jens Erik Fenstad, professor emeritus i matematikk ved UiO, blant annet om matematikkens rolle som bindeledd mellom menneskets individuelle sinn og verden der ute i vår søken etter kunnskap, forholdet mellom ren og anvendt matematikk, samt eksistensen av abstrakte objekter som kulturelle entiteter. Fenstad har forfattet en rekke verker, deriblant Grammar, Geotmetry and Brain (CSLI Publications, 2010). Jens Erik Fenstad is professor emeritus in Mathematics at the Univerrsity of Oslo. He has worked on mathematical logic, non-standard analysis, and on the applications of mathematical methods in linguistics and physics. He has chaired the Norwegian Mathematical Society and UNESCO’s World Commision on Ethics (COMEST). Fenstad was also one of the co-founders of the Abel Prize. A lot of modern day science, especially natural science, is done with mathematical tools. How central is mathematics to human knowledge? The reason mathematics has come to dominate the most central aspects of science is that knowledge is based on what we ‘see.’ The word ‘see’ is in quotation marks – I mean to perceive, measure, observe, etc. The question, then, is how to convert what we see into something we can use. I apply the word ‘structure’ to what we ‘see,’ and ‘algorithm’ to how we transform what we see into something doable. Structures and algorithms have to be connected, and that is where mathematics enters. Because of the great success of mathematical modeling, mathematics has come fully to dominate this picture, but actually mathematics is just the connection between what we see and what we do. That is why mathematics as such is central in understanding knowledge. The connecting element is a language, but ‘language’ understood in a sufficiently broad way – including all kinds of mathematical formalisms: programming languages, marks in wood, and so on. I focus on this kind of connecting element. Since what we do often deals with measureable things, it is quite natural that mathematics enters into this. Even at a less advanced stage, we count and also use elementary ideas about geometry and structures. So mathematics plays an essential role as a connecting element between structures and algorithms. With the technological advances in what we can do, we sometimes need to be more precise in the connecting element. The great example of the mathematical model is of course celestial mechanics where the structure was established by Copernicus with the heliocentric system, Kepler with the shape of the planets, and then Newton added the dynamics. But then, in order to measure time, you need to have a more precise element, and that is where the equations come in. So, for physicists it is the equations that rule and act as the connecting element. Essentially, I think the picture is broader; we can see with the advances in information technology today, that it is not the equations that rule, but rather programs that provide the language for algorithms. Mathematics is an increasingly important kind of connecting element, as we can now see in the life sciences, where we have much more precise models, and we can use the language of equations to a much larger extent when studying, say, nerve impulses. One can see this in for example the famous Hodgkin-Huxley model from the 1950s, which is a mathematical model that describes how a signal travels in the brain. That was one of the great breakthroughs in the use of non-trivial mathematics in the biological sciences: a non-linear partial second-order differential equation. So, this is in many ways the basic analysis: structure and algorithm are two very central components, and then mathematics enters as the connecting element – as one example of a connecting element. Seen this way, it is quite natural, or inevitable, that mathematics has an increasing role in codifying, using, understanding, and acquiring knowledge. You have already mentioned the concepts ‘structure’ and ‘algorithm,’ and in your articles you also mention ‘syntax.’ And you have now talked about how they are central to the nature of knowledge. Can you explain in more detail what these three concepts, ‘structure,’ ‘syntax,’ and ‘algorithm,’ mean? My use of ‘syntax’ was my heritage from the linguistic sciences, but I now prefer the word ‘language,’ rather than ‘syntax.’ I wanted to distinguish ‘syntax’ from the semantic aspect of seeing a structure and the application to algorithms. In mathematics and geometry you hear a lot about geometrical structures. In arithmetic you hear a lot about number structures. These are examples of structures. In social psychology you have Eleanor Rosch with her theories about prototypes – that is also a kind of structural insight. But I basically rely on the original notion of structure I learned as a mathematician and logician: you have a set of elements – these sets and elements are quite abstract and can be anything – and you have properties of elements and relations between the elements. And I agree with a fundamental insight of phenomenology: structures do not exist in the objects we see, structures are patterns we impose on the objects we see. You can see this for example in the current discussions in the newspapers about modelling in the environmental sciences. The science uses models, but they are only partial models because of the complexity of what is seen. When you model, you try to catch something, but you can hardly catch everything, as you can to some extent when studying the movements of the planets or running marbles on a slide, as Galileo did – they were very simple systems. So, a structure is something we impose on what there is, but it is only an aspect, a slice – it is only partial. That is what makes predictions and things like that always uncertain. The word algorithm is interesting. Algorithm goes way back in history; in its most primitive form it is a step by step prescription of what to do in a given situation, leading you from certain observations, facts, and things, to something you can use. I mean, a recipe for cooking, rules of grammar, and rules of law – algorithms exist everywhere. They have a quite rich history and you see attempts of getting more efficient methods of algorithm. The introduction of logarithms was a great step forward in the effectiveness of making computations; reducing multiplication to addition of algorithms – that is the secret behind the exponential function. With the growth of the machines there is an increased demand for a more precise concept of the algorithm. It was only around the mid-1930s the central concept really crystallized and a notion was defined – through the work of many people, Alan Turing in particular. There is a consensus that the notion of a general recursive function that emerged out of this is the correct notion of algorithm. And it is an absolute algorithm – it does not depend upon the language, it does not depend upon the computing machinery. You have to make a distinction between what is in-principle computable, and what is computable in true time – what is feasible. Computability and computational feasibility are two different concepts. That is easily confused, but really important. One of the first examples where we really saw the importance of this was in weather forecasting models computed at the Institute for Advanced Study in 1951; they felt that they had the correct equations, but solving the equations was not doable in real time. These concepts, structures, and algorithms are not really independent – there is an interplay. A great thing at that time was that the modification of the structural insight was not purely a mathematical game, but dependent upon having a real understanding of the phenomena. Then, you can make simplifications, which make the solutions of the equations computable in real time. And that is a very fascinating story about the nature of knowledge, where all these elements – structure, algorithm, and language – are intertwined. Do you think that modern day scientists sometimes confuse structural insight and computational feasibility? Well, sometimes. It is a thing you see in simulations. Sometimes you feel that the models you have are so comprehensive and cover the phenomena so well that you can just sit in front of your computer and never need to look at nature or human beings. Sometimes scientists can become too enamored, too convinced by their models, that they just live inside a world of models. But there is a distinction, and while most scientists do acknowledge this, the scientists in climate research, for example, are painfully aware of the limitations of their models. But if you argue that there are benefits of comparing the models to the world out there, to see how it works in nature, could it not therefore be argued that in some way the structures exist in nature? I would not admit that. There is a difference between an algorithm and the implementing machinery and tools you use to carry out a calculation. So, an algorithm is abstract. You do not find an algorithm as part of nature. When it comes to language, for instance, I hold (against Chomsky) that the basic thing is what we ‘see.’ What we ‘see’ can leave an imprint on the human genome. We have learned today that the process of imprinting the genome from the outside is a much faster process than originally postulated in evolutionary theory. So whether language starts with gestures, or just starts with signs, there is, first of all, an evolutionary advantage in splitting the message. The works of an Austrian-American biologist at Harvard, Nowak, has a very convincing analysis, which is on par with what you do in evolutionary theory. Splitting up a message is more effective than just giving an unanalyzed message. And that kind of thing can have an imprint somehow – we do not understand exactly what is imprinted, but it sort of gets activated in a young child. But the imprint is not grammar, as a formal structure, but a certain ability or a certain structure of the neurons, which makes this learning easier, faster, inevitable, or whatever word you use. With language it becomes a cultural advantage to split up messages in parts corresponding to what you see, and that cultural advantage may have – and more probably in this case – an imprint on the genome. Chomsky comes in at a later stage and says that human beings have a special gene or genomic structure, which dictates grammar. That is, according to my view, entering the story at too late a stage. On the one hand, how can mathematics be applied to topics central to the humanities, such as language and meaning, and then on the other hand, what are your arguments against the reductionist strategy, such as Hawking’s belief on reducing the study of human behavior to a branch of applied mathematics? The first question concerns the applicability of the method. The point is the structure; you ‘see’ a certain structure, you create a formalism, a language or such to describe this structure, and then you extract algorithms from it. In the natural sciences you have it everywhere. It has also become more and more prevalent in the social sciences. But as I have said, in the natural sciences the method is limited because you have complicated equations, so-called non-linear equations. For instance, the recent disaster in Svalbard could not be predicted because the equation is non-linear, and you cannot calculate exactly the future story from the data as you can with spaceships, where the equations are much simpler in structure. But in many other sciences, you do not have enough structural insight, so the structures you formulate – before you start computing, using statistics, etc. – are too incompletely understood. You do not really have a grasp of it. You do not have the language needed to achieve preciseness. This happens sometimes in all the sciences where you deal with human actors, but also sometimes in nature. So that is a limitation of the method. If the connecting element is widely enough understood, and if with algorithm you are not only thinking about the last type of computer or smart phone, but any prescribed rule, you will find it everywhere. But the important thing is that all of these concepts are abstract concepts. In a certain sense they are, in my view, culturally dependent. You have nature, you have the individual mind, and then you have the ‘mind of the species,’ which is the distributed knowledge in culture, as you say. Algorithm is an object in the space of common consciousness, or in cultural space. Physical computers live in the actual world, and we, the individuals, are sort of the connecting element. There is no direct connection between the abstract concept of algorithm and the computing machinery. It is through the individual mind that abstract concepts are connected to the real world. And that is quite important. One area where this is extremely confusing is the study of consciousness, I would claim, and now according to some other people as well. For example, Christof Koch and Francis Crick tried to hunt for the seat of consciousness in the actual brain. But consciousness is an abstract concept, just like ‘algorithm’. But individuals may be in, what we can observe as, stages of consciousness or non-consciousness, and that may be related to states of the brain and so on, but consciousness is not something that resides at some location in the brain. Both the notion of algorithm, the notion of number, the notion of consciousness, the notion of language, and things like these, show the importance of recognizing the existence and the importance of abstract objects. We use them all the time. But it is we who use them. What an infant learns is imposed; it partakes in some way – we do not always understand in what way – in the mind of the species, in the culture. This is showing how mathematics, abstract objects and concepts, can be applied in all kinds of inquiries, but the temptation is maybe to go too far and think that all sciences – except pure mathematics – can become applied mathematics. The questions was, how do you resist that step of going the reductionist way? I did not say enough about reductionism; let me return to that. Mathematics is enormously successful, but if you insist that mathematics is just one of many ways of connecting structure and what we ‘see’ to what we do, then you can resist reductionism. Mathematics, like language and many other things, was created in order to apply or make use of what we see. That is why mathematics is obviously applicable – in the same way language is obviously applicable to describe things. No one really thinks that it is a mystery that you can talk about everyday things – home, chairs, equipment, etc. – well, maybe some philosophers will doubt that you can do this, but not to the same extent that they are skeptical of the mathematical methods. Mathematicians may become too enthusiastic about the tool, and become not an applier of the tool, but a tool maker, and then start to do more and more like a builder of musical instruments making all kinds of additions to it. However, that does not negate that it is possible to play a tune that can be appreciated by others. And sometimes, out of this play with the tool, you create new structural objects, but they are purely abstract. It may be that some of these abstract objects, some of the things you play with, can be part of a later structural insight about nature; that has happened and it is not particularly mysterious. As for example Riemann’s geometry was for Einstein. Mathematics has become in a sense too totalitarian, or intimidating, so I recommend a much more relaxed attitude towards it. It is not a natural science; it is a language, or a tool that we have created. And that is where I differ from Platonism and phenomenalism. This has to do a little with reductionism. There is interplay between the various components – the mind of the species, the individual mind, and nature. As I tell the story: the impact come from the outside – in what you ‘see’ – and then you create something that can give you a way of handling what you ‘see.’ And that is why language is so obviously applicable and, similarly, why mathematics, or any other kind of connecting element, is applicable. But there you see information, and the impulses flow both ways, and not only as Hawking would say, from the basic equations of physics up through meaning and so on. That is sort of like saying that every individual is a world onto itself. Both reductionism and simulations are what I will call ‘natural.’ For me, these are quite obvious elements with complex explanations. At University of Oslo and many other places, mathematicians distinguish between pure and applied mathematics. But you mention the notions of the ‘hired hand’ and the ‘tool maker.’ Why do you prefer these two terms instead of pure and applied mathematics? Because I think that the ‘hired hand’ is interested in the connection, while the ‘tool maker’ is there to develop the tool, in a certain sense. Not all mathematicians agree with me there, and they might be a bit offended by being ‘reduced’ to either the ‘hired hand’ or a ‘tool maker.’ They think of their subject as the queen of all the sciences, but I think that is the wrong way to look at things. Mathematicians should be content to occupy their limited, but well-defined domain within the whole body of acquisition and applications of knowledge. So then you disagree with people who take pure mathematics to be a distinct branch of science, studying its own entities, numbers and so on? Abstract things can take on a life of their own, so they cultivate this. You can elaborate on any kind of abstract thing. For instance, a lot of art – being founded on some kind of impression from the outside – takes on a life of its own. It is the same with mathematics, and since mathematics is a language of extremely rich structure, one can excuse mathematicians for being in a way self-sufficient and, in a certain sense, isolated from its applications. However, the real purpose of mathematics is being one of the connecting elements. In your view, what is pure mathematics, or the ‘tool maker’? Is it knowledge about something specific, or specifically mathematical? Or is it more of a technical ability? Again, technical ability – talent – belongs to the individual and is no part of the abstract. Being able to carry through a complicated proof is an individual ability or talent. Here I agree much with Øystein Linnebo, and I have discussed this at great length with him. I seem to agree with some people. I do not agree all the way with Dagfinn Føllesdal, but I have corresponded a great deal with Richard Tieszen. I think that Tieszen, Linnebo, and I agree on a great number of things. In the sense that there is a cultural foundation, and that has to do with ordering, counting. This is the ordinal view, not thinking of one-to-one correspondence and that sort of thing, and while it is very much the focus of several analytical philosophers, I focus on ordering. From the ordinal point of view this becomes sort of culturally founded, and then what you do is that you abstract from this ordering. You abstract from certain abstract objects you call numbers, but they do exist according to me: it is not fiction. In this sense, I am not a formalist. Numbers exist as cultural objects, and they are abstracted and have various properties. And Linnebo describes this in his forthcoming book on ‘thin objects,’ and I agree and follow him up on that. I use an example from geometry: you have affine geometry – geometry of the plane, or one-dimensional lines, points, etc. You have parallel lines and then you have the family of parallel lines defining a direction. And then you could talk about directions, but that is reducible to talking about parallel lines. But then you start to use directions, and the collection of all directions as a first step of constructing coordinates for that geometry, and then directions become, in your thinking, objects. And it is quite natural for people who work on this to consider these as objects. So not everything you think of necessarily achieves the status of an invariant or universal cultural object, but, as with grammar, I would hold that with numbers you abstract from what you experience, and then, what is abstracted is directly applicable. It is interesting to know that not everyone is capable of performing these abstractions. There is what I call ‘kitchen arithmetic’ and ‘street vendor arithmetic’ where the street vendors can sell roasted chestnuts and know exactly what money he should have for what he sells, but he cannot write down the price and add up the prices. He simply has this knowledge at a very primary level. Most of us have the ability to make this abstraction, and look upon what we did as new objects in the higher level. That is the kind of reflective step that you also have in phenomenology, that you transcend a previous step. Linnebo more or less wants to stop there and say that his theory is sufficient to have a good epistemology and ontology of mathematical objects. Tieszen agrees on some kind of cultural foundation, or impact rather, for his constitutive Platonism. I would, sort of shamelessly, claim that culture is enough. What we have learned about how culture can impact the human genome is that this cultural practice, or this cultural learning about numbers, in reasonably short time ­– we do not know exactly when – have left an impact on the human genome. Not as the completed number system, but in a kind of facility for learning about numbers, absorbing numbers, and understanding numbers. A learning mechanism has in some way become a part of the human genome, so that it is not only learning how to walk, eat, etc., but it is also learning how to use language, how to learn elementary arithmetic, how to count. When the human species evolved, we were not originally born to be able to walk. Physical movements were developed. But those ideas are also automatic. I mean, the child learns to walk very fast because there is a part of his or her build-up that facilitates this learning. I would claim the same for mathematics, and that this is sufficient to give mathematics its exalted state. So I disagree with a lot of philosophers of mathematics, but also in particular with phenomenology. Having been exposed to Dagfinn Føllesdal’s phenomenology for half a century, I am sort of on nodding acquaintance, and it is interesting, although I do not understand everything. But I resist him in the sense that with mathematics, as well as other aspects of phenomena, there is a complicated story to how it became invariant, though it is nothing more than part of the minds of the species: nothing beyond culture. And that is also why I believe that this impact from culture gives rise to the traditional arguments against reductionism. First of all we do not know – like with consciousness studies – what is the abstract concept, what is there, what is really there, and so in analogy to simple physical phenomena, we go too far. Even in natural science, reductionism is not at all established. No one has really reduced thermodynamics to statistical mechanics. And an obvious example that should make you pause is that in order to observe critical phenomena – water boiling, water freezing to ice – you need a certain singularity in the equations to shift from one state to the other. But to obtain this singularity, you have to go from a finite volume of water to an infinite volume of water, because in the finite domain, the functions are analytic and have no singularities, and water cannot boil. So you have to go to this fiction, an infinite volume, in order to explain from statistical mechanics that water can boil. It boils! But we have no really good convincing mathematical model for understanding why. And so before claiming that reductionism is a universal doctrine, please explain one of the simplest examples. And in non-equilibrium systems there are no reductions at all. That is, thermodynamics is far away from equilibrium. I think that reductionism is too simple and totally unnecessary. There is no need for reductionism. Yes, you can in certain cases have a more precise structural insight, but the important thing if you want to understand a phenomenon and employ it is to have the right structural insight, and then create the methods used there. And we see that also in quantum physics and relativity. You had the quantum electrodynamics connected to the names such as Feynman, Schwinger, etc. They received the Nobel Prize, but the one who did much of the mathematical work was Freeman Dyson. He struggled with this, and quantum field theory is not a unified theory; it is a wish. So Hawkins should be more careful about that part before he starts claiming that he has solved all the equations for biology and social sciences. Dyson simply has an argument, which says that quantum theory and general relativity are two different ways of looking at nature – two different structural points of view. There will be no way where they can contradict each other, so we can safely use both of them. Where we use relativity today with quantum physics, as in particle physics, it is only special relativity, and special relativity has a preferred coordinate system that you need to have for quantum mechanics, whereas general relativity is a different kind of geometrical structure, and it is lack of this coordinate system that blocks the reduction there. My claim is that I have a very robust and relatively uncomplicated view of the world. It is there, and I try to grasp it by imposing structures on it. There is another interesting discussion – but it is more within pure mathematics. With the focus on mathematics being the connective element, giving you algorithms – how you can use what you see and that sort of things. This contrasts a bit with the focus on the axiomatic method, in parts of mathematics. How important, or essential, do you think the axiomatic method is in mathematics? The same kind of criticism will also apply to general methodology, where you start with a language, you start with rules, you start with hypotheses, and you start using things and you hope that it is a law of nature. If you turn it around, you have what I call a kind of model theoretic, or structural, or geometric view of methodology, and I think that is important. So for me axioms are tools, but we know of limitations of axioms. I mean, there are principal limitations. Tools are of the outmost importance in organizing our knowledge, or keeping order in our tool box – to see how the tools are related to each other and so on – but mathematics is not captured by axioms and rules. Again, we do have insights about discrete things, we do have insight about the continuous, and I would claim that the real line – the geometrical continuum – is not a point set, is not a set of real numbers. Whatever point sets we introduce, it is just a coordinate system we impose. And this is something I find evidence for in Skolem – also he looked at mathematics in this way. But if we study real continuae, he says someplace, then axioms are not there. In order to achieve preciseness we often use the axiomatic method to bring order; it is easy to learn and it is precise. The way mathematics is taught is totally alien to the way mathematics is created. You do not sit with a system of axioms and play around with axioms and change the rules. What you try to see are the structural insights. So it is a way of teaching things. But maybe it is also the wrong way of teaching – a teaching that alienates people from the mathematical sciences. It is interesting that you mention Skolem and his approach to mathematics and the axiomatic method – can you say a bit more about this? Skolem was a very productive mathematician. And the axiomatic method is a powerful method. A precise notion of algorithm is not necessary when you find an algorithm to solve a problem. Then, you convince yourself that it is doable in real time. But if you are uncertain, if you do not know if an algorithm exist, then you need to have a precise notion in order to show that something does not fall under this concept. And it is the same with the axiomatic method, it really organizes, but in nature you see things, and there are phenomena in nature that requires methods. That is the reason why I became so interested in non-standard analysis at a time, because there you found a method of dealing with things that could not be fitted into the standard formalism. I am not a physicist, but I have used the ability of non-standard analysis to tackle problems of infinities that occurs within finite domains. Sometimes, at least in number theory, you can think of the history of mathematics as adding things to the number line, the geometrical line. First, we had the natural numbers, then we had the negative numbers, then there were the rational numbers, the irrational numbers and so on. You think that it has gone beyond even the real numbers, or the standard real numbers. Could you tell us about your work in non-standard analysis, and how you think that it is philosophically important? All what you have said is that we use numbers to mark measurements on geometrical objects – in your garden, in your house, or whatever. Then, you observe that certain obvious measurements, such as the diagonal, did not fit in with the numbers, or the way of marking. So you invented new ways. So this was a continuous process, and in this way you overcame difficulties that you could not really solve. Complex numbers, or imaginary numbers, came in as means to solve certain equations that did not have solutions in the numbers that you already had. Also, you see that one way of thinking of the non-standard numbers is that they enrich your ability to mark measurements on the line, so that you can distinguish more points. Of course, some people say that infinitesimals do not exist because they should be larger than zero and less than one or n for each natural number n, and there does not exist anything way down there, but yes, it can exist, and there is a way of creating a measurement instrument – the non-standard numbers – that allows you to mark different points in an extended geometric continuum. You can put these numbers to good use, and it simplifies many arguments. One argument, which is convincing to many mathematicians, is that say you want to have a measure on the interval [0, 1]. So, you can divide it up in certain points and then you measure things at these points, but you want to measure it even finer and finer and you want to mark more and more points, more and more ordinates, to find your curve and things like that. And usually you stop. But to have a complete theory, you want to go to the limit. You start dividing further and further, and the more you count and divide, the better the approximation. But the point is that when you go to the limit, it does not exist. The reason why it does not exist is that each of these measurements is with respect to a certain basic space, a finite division. Here, and many places where you go to the limit, you have a fixed space and you let the functions vary or maybe go to a limit, but the space is fixed. Here, also the space is changing – you have finer and finer subdivisions. And if you then should give each point equal weight, if you go to the limit, you get zero. So that is why you allow this larger division and take a hyper-finite number, an infinitely large number, and divide the line in this way. So the non-standard analysis allows you in a direct way to transfer finite simple combinatorial arguments to the continuous case by first going to what you call this hyper-finite extension, and then take the standard limit. In a few lines you have constructed what takes about three or four weeks in most math courses to construct, the Lebesgue measure on the interval [0, 1]. Here is a case where the extended coordinate system allows you to carry through constructions that you earlier had for simpler combinatorial systems. Do you think that this gives enough reason to say that infinitesimals exist? Well, the infinite is an abstract object. You do not see infinities. You can see boiling water, but you do not see the infinity in the equation that explains it. Again, this is a concept that we develop and there is enough of a consensus to give it a fairly precise meaning – of course with infinitesimals it is a bit contested, not all mathematicians would agree that infinitesimals exist. Skolem introduced the non-standard models, but there is one famous oversight of Skolem. He constructed large numbers, but he did not think of inverting a large number to get an infinitesimal. That was exactly what Abraham Robinson observed. It was a very simple observation and out of this grew a whole new praxis. Related to the question of the existence of infinitesimals. You said that they exist as abstract objects, but we are curious about how, or in what way, mathematical objects exist. Are they discovered or invented? Gödel, for instance, says that they exist robustly and independently as abstract objects, but still that they can be perceived, or intuited, in a way. To me, they are cultural inventions. They are invented, and become accepted in the culture as objects. Not everything we think of advances to the stage of culturally shared objects. They will remain private objects – your nightmares, the fat man in the door, etc. But there are certain things, such as grammatical structure and number structure, which are a part of culture – independent of the individual, but dependent upon the culture. They do not exist as objects in the world exist, and they are created, not discovered, according to my view. But it is quite essential to observe that we do not know all the properties of objects that we have created, so having created numbers do not mean that we should be able to answer every question about numbers, and in this way they are like ordinary physical objects in that we see them but do not know all their properties. So there is a difference between invention and discovery. So you think we can discover properties of the abstract? Yes, we do that all the time. I tell this story about Hardy visiting Ramanujan, and remarking on the number 1729 being a dull number, and Ramanujan says: “No, no, Hardy, you are wrong. It is the only number that can be written in two different ways as a sum of two cubes.” And, you see, that was a property he discovered. That was not part of introducing that particular number. That particular number was introduced by its place in the number series. We add numbers to count things, we multiply numbers to measure our garden etc., so you have to insist on the difference between invention and discovery. Because, the fact that it is invented does not mean that everything can be discovered about it. If the existence depends upon invention, what then about for instance Fermat’s last theorem? Did it exist when Fermat wrote down in the margin that he had a solution in his head, but did not have enough space in the margin to write it down? Or did it exist some 200 years later when it was proved? The sentence you just uttered, did it exist in your mind half an hour ago? One hour ago? The point is, with language we can formulate many things and there is no requirement that every uttered statement should be an unuttered truth from eternity to eternity. This is a question that does not really make sense to me. When you write it down there are problems and things like that, but there are so many things not yet written down, and I do not claim that someone ‘up there’ has suitcase after suitcase with unuttered problems to deliver to us. I understand your question, but I do not see it as something that worries me, or is a problem. How is your philosophy different from intuitionism, for example Brouwer’s intuitionism? Is it that you do not see it as a very relevant question when mathematical objects come into existence? Brouwer claims that when something is proved, then it exist as a truth. I do not have a very deep insight into intuitionism. Brouwer denied the axiomatic and the formalistic attitude and he wanted to build on the human insight. That is his basics. That can lead to different doctrines about what kind of constructivism or formalism you should construct – that is one point, and I do not want to enter into that discussion. I use whatever methods I can use to solve things when I am working in mathematics. By locating his intuitionism into a cultural context, you can account better for the applicability of mathematics. One great mathematician, Herman Weyl, became convinced by Brouwer at one point – about the intuition part – but then he slid back to Hilbert, or to the classical mathematics, when he had problems with the applicability of groups in quantum mechanics. And I think that that is where the difficulty with Brouwer comes in – with the applicability of methods. 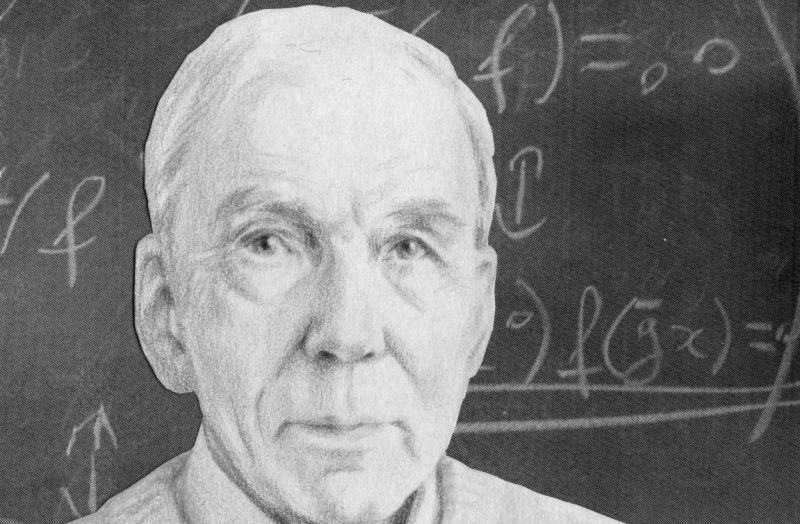 I agree with the basic attitude of Brouwer, but I do not agree with fulfilling his wish in creating his mathematics. There is not one way of doing that. I think that Per-Martin Löf is much better or more reasonable. And whereas things do not exist before they are constructed – yes, that is true. You have to have a witness to an existential quantifier, but you can frame questions of existence, but then there is an existential quantifier. Does there exist a function with these and these properties? According to Brouwer’s doctrine you had to construct it in some way, and not use indirect proofs. I would allow that. I have no hesitations to, and have used myself, indirect proofs. However, the primary point of Brouwer, namely that mathematics relies on human intuition, is one I share. You think that abstract, or mathematical, objects are cultural inventions. Husserl objected to this view because he thought that cultural objects are bound to their location in space and time, while mathematical objects are not. How do you meet that objection? The objects have a certain cultural invariance. That is my answer, and this is a question I have discussed at length with Tieszen. We disagree, but he agrees that my point of view is an acceptable point of view, and I agree that his view is an acceptable point of view. We agree to disagree. But he does not claim the same as Husserl did about the point of view that I have. The point is, this cultural view is not bound to times and places, it has a certain invariance. I think that what we now have started to learn about how quickly things can be impressed upon the human genome strengthens this argument. But this is a large issue about the real connection between grammar, meaning, and brain. This notion of invariance – that is the reply? The cultural invariance, or the cultural stability. It is a kind of cultural stability. It is in the culture. It is different in the individual – what the individual learns and the cultural stability. You mention somewhere that this view is not very foreign to mathematicians, but for philosophers of mathematics it is less popular. Could you talk about what has happened between these disciplines – mathematics and philosophy of mathematics? Why are there so many strict Platonist philosophers of mathematics and why does mathematicians feel that the cultural view is more acceptable? The simple answer – and it might sound a little bit arrogant, but it is not meant as arrogant – is that mathematicians do mathematics. As I said, when you start to construct the coordinates of affine geometry, directions become objects that you work with and do not reduce. In the same way as we do not reduce real numbers to sequences. We introduce new objects, and feel comfortable. I just came from a seminar with the mathematician and logician Dag Normann and he said “this function came to me when I was walking last Sunday with my dog.” Mathematicians spend their lifetime working with these objects, they are familiar with them, and they work with them. So you would not feel a loss if that was a kind of invention, and that is was not something you discovered in the same way as you discovered something interesting about galactic formations? Galaxies are objects in the world, but mathematical structures are abstract objects. Mathematicians tend to approach abstract objects as if they were real, by making diagrams, pictures, simulations, and things like that. But behind this there is a distinct feeling, and when some mathematicians are pressed by their philosopher friends to defend this they backslide a little bit and become uncomfortable with these abstract objects and say “Well, perhaps… It is only a way of speaking, etc.,” as Abraham Robinson himself did with non-standard analysis. He said that “But we need not think about [non-standard numbers] as objects, we need to think about these non-standard numbers as way of extending our powers of reasoning.” About what? He did not say. But there again, he felt a bit uncomfortable by acknowledging this. Abraham Robinson was approached by Gödel, who said to him that these things are as real as numbers. That was his approach. It was uttered at the Institute for Advanced Studies in the presence of Robinson. Gödel wanted Robinson to succeed him at the institute. He was the only one Gödel recognized as being up to that task. With Gödel you mean in the Platonist sense? Yes. Tieszen calls it the post-Gödelian Platonism. He says that he would only acknowledge properties in this absolute existence – only when they have sufficiently cultural grounding, or are anchored to culture in this sufficiently broad way, and then he talks about arithmetic space etc. In the end we have a sort of big picture question. You have the notion of the ‘mathematical way.’ Could you summarize what the mathematical way is and why you think it is important? I use the ‘mathematical way’ because much of my actual thinking about structure and algorithm comes from the art and science – both are important – that is, both the art and the science of mathematical modeling. You ‘see’ some structure, whether it is in the nature or in the brain, or wherever, and you create a method to describe and capture this structure and in order to develop ways of handling the structure, in either predicting how it will develop in the future, or for productions of constructions in a more applied, immediate context. I would not say that this is all there is to say about knowledge, but this is for me a powerful method of gaining or obtaining knowledge, and a way of using knowledge. The ‘mathematical way’ is a label inherited from the art and science of mathematical modeling to use for this kind of activity. However, there is also a kind of warning, and that is: this is a way that is extremely well adapted to our age, our digital age. And with new computing techniques, deep learning machines, all these kinds of things, you might feel that this is the only way, and that everything can be reduced to this, that algorithms can supplant every aspect of human activities, and that is why it is very important to know that there are certain limits that are absolute. The notion of algorithm is absolute, no quantum computers, no machine learning can circumvent this. So the ‘mathematical way’ does not eliminate the creative human being. The creative human being is absolutely essential at the starting point, where new and unexpected things happen. No algorithm, and no previous mathematics, could have foreseen Einstein’s analysis of space and time, for example. And since structures are something we impose, we must recognize our limitations.